Born John Quinn Picus in Janesville, PA, he spent his early years working as a coal miner. In 1909, at the age of 24, he became the first Polish American to play major league baseball since Oscar Bielaski. He went on to spend 23 seasons in the major leagues with eight different teams. Quinn relied mainly on the spitball, being one of the major league pitchers allowed to continue using the spitter after the pitch was outlawed in 1920. He won 247 games and lost 218 with an ERA of 3.27. Quinn helped pitch the Yankees to their first pennant in 1921 and aided the A’s to two successive flags in 1929-30. Quinn played until he was 50 years old, playing his last game on July 7, 1933. Among his many records were, oldest player to win a major league game (49), start a World Series game (46), finish a World Series game (47), and hit a home run (47). Jack (Picus) Quinn was one of the early Polish American major leaguers, a right-handed pitcher who enjoyed a remarkably long and productive big league career that started in 1909 and didn’t end until 1933. His longevity earned him the nickname of “The Baseball Methuselah,” after the biblical figure who reportedly reached the age of 969 years. Jack Quinn was born John Quinn Picus on July 5, 1883 in Janesville, PA. Little is known about his early life but, like many other Polish Americans, he spent his early years working as a coal miner. The story goes that he caught the eye of a manager when, while watching a semi-pro game, Jack threw a foul ball back from the stands to the catcher. The visiting manager was impressed by the throw, and he offered the young man a contract. In 1909 the 6-1, 185-lb. hurler became the first Polish American to play major league baseball since Oscar Bielaski. Bielaski completed his big league career in 1876, several years before Jack was born. Like most of the relatively few Polish American ballplayers after the turn of the 20th century, he anglicized his name and became Jack Quinn. Others of that era included “Bunny” Brief, a minor league home run champion , who was born Anthony Brotzki; and, “Whitey” Witt, the leadoff hitter for the World Champion 1923 New York Yankees, who was born Ladislaw Wittkowski. Quinn launched his major league career with the New York Yankees in 1909 when he was 24. He went on to spend 23 seasons in the major leagues with eight different teams. Jack relied mainly on his low-breaking spitball, which was a legal pitch at the time. He won 247 games and lost 218, also collecting 57 saves, with a 3.27 ERA. Quinn helped the Yankees to their first pennant in 1921 and the A’s to two successive flags in 1929-30. His best season was 26 wins in 1914, but he won 18 three times, including an 18-7 mark and 2.90 ERA with the 1928 A’s at age 45. Quinn played until he was 50 years old, as his final game was on July 7, 1933. 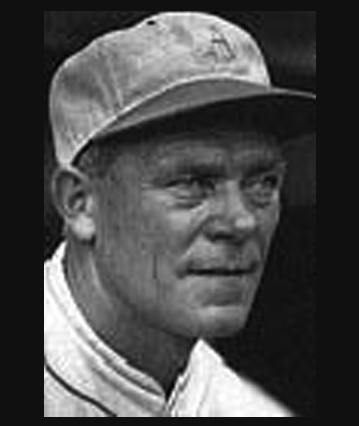 He left the sport with several age-related records, including being the oldest major leaguer to win a game, to hit a home run, to lead his league in a major category (saves, in 1932), and to start games in the World Series (with the Philadelphia Athletics, in 1929) and on Opening Day (with the Brooklyn Dodgers, in 1931). “Big Jack” pitched for eight teams in three major leagues during four different decades. Quinn’s longevity was due in large part to his fitness regime, which was unique for that time. He considered baseball a year-round job, and took long hikes through the hills of Pennsylvania during his off-seasons. In addition, he gave up smoking, avoided alcohol, and never ate more than two meals a day. Quinn died quietly on April 17, 1946 in Pottsville PA, and in time his baseball career was largely forgotten by all but baseball historians. However, he did get some attention this year when one of his milestones was finally surpassed. Quinn’s mark as the oldest man to hit a home run in the majors, set 75 years ago, was broken this season by Julio Franco. (It should be noted that Quinn is still the oldest pitcher to have hit a homer.) Jack (Picus) Quinn is also getting some much-deserved attention with his enshrinement in the National Polish-American Sports Hall of Fame Class of 2006 as one of the Greats of the Past.